16 February 2017 Mumbai: ‘No job is too big or too small’. 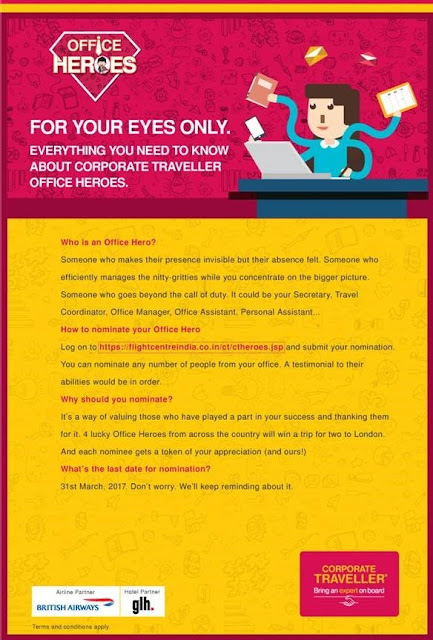 Keeping the essence of the saying intact, Corporate Traveller, in partnership with British Airways and GLH Hotels today announced the Office Hero Campaign to recognise and celebrate unsung office achievers across the country. 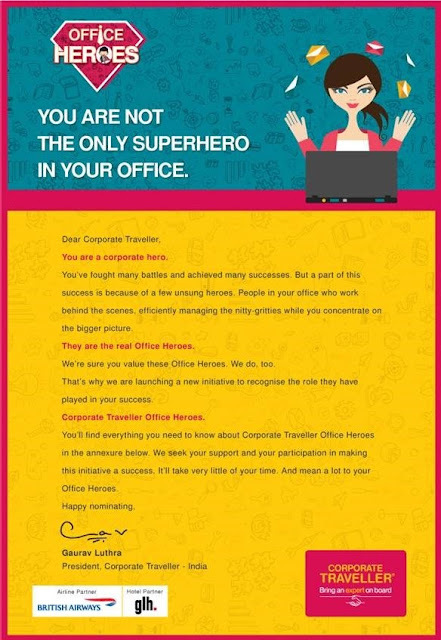 Aimed specifically at office assistants and managers who keep office operations running smoothly, the Office Hero initiative by Corporate Traveller will offer a journey of a lifetime – an all-expense-paid holiday to the most popular dream destination – London. The campaign intends to recognize employees for their outstanding work. 2.The employer has to submit a small write-up as to why s/he thinks his PA/ Office Manager is the Best Office Hero. Commenting on the campaign, Mr. Gaurav Luthra, President, Corporate Traveller, FCM Travel Solutions, says, “The team at Corporate Traveller India firmly believes that office managers are real office champions who make workplaces function seamlessly. In the midst of busy corporative lives, their contribution often goes unrewarded on account of the variety of tasks they undertake (including booking all the office business travel). In fact, many of them go way beyond their job description. Through the ‘Office Hero’ initiative, we want to acknowledge their contribution and celebrate these unsung heroes across the country. This campaign will surprise and delight the clientele, and provide an opportunity to both us and the employers to build stronger relationships”. Corporate Travellers stands by employee recognition and realises that it can be a key part of an overall strategy to promote good company values and help employees feel invested and motivated. Corporate Traveller offers a range of specialised business travel solutions and corporate travel management services to make travel faster, cheaper and greener. Behind every successful manager is an office hero. Nominate yours now! *Nominations are accepted till 31st March, 2017 and the winner will be announced in April, 2017. Corporate Traveller is part of the Australia-headquartered Flight Centre Travel Group, one of the world’s largest travel companies. Corporate Traveller manages business travel programs for small to medium enterprises (SMEs) and is present in six countries globally. Corporate Traveller offers a range of specialised business travel solutions and corporate travel management services to make travel faster, cheaper and greener. Our industry and group specialisation means clients receive expert advice and service that is tailored to suit their needs. Established in 1993, Corporate Traveller was FCTG’s first corporate brand. Initially called Flight Centre Corporate, it developed into a highly successful brand known for its personal service and expert approach to travel management. In 2012, Corporate Traveller was named Best Travel Agency Corporate - Multi Location at the National Travel Industry Awards for Excellence. Flight Centre Travel Group, headquartered in Australia, is one of the world’s largest travel companies. After starting with one shop in the early 1980s, FCTG has enjoyed remarkable growth to become an AUD $19.3 billion business consisting of more than 40 brands. The group has company-owned operations in 14 countries and a corporate travel management network that spans more than 90 countries employing over 19,000 people globally. FCM is transforming the business of travel through our empowered and accountable people who deliver 24/7 service and are available either online or offline. Leveraging FCM's negotiating strength and supplier relationships in conjunction with our tailored business travel programs, our expertise delivers more for our clients where it matters most to them.